A simple tutorial on How to Can Applesauce in 4 basic steps. This is so simple that anyone can do it, and our family will enjoy applesauce all year round! Canning was a regular part of this time of year for my mom. We always had canned peaches, tomatoes, applesauce, pears, salsa, jam etc.. on hand. I probably took for granted how lucky I was to have Raspberry Freezer Jam available all the time! We used our canned goods in everything! Canned tomatoes went in soup, canned peaches went in my favorite cobbler recipe. Canned Applesauce with a little cinnamon on top was my favorite after school snack! How long are is canned applesauce good for? If canned applesauce is properly stored, it will last 18-24 months (at best quality), and are often safe eating after even longer than that. How do I know if my canned applesauce is safe to eat? Always make sure your mason jars do not show signs of leaking or rusting. Press down on the center of the lid: it should not pop back. If it sits flat it is safe, but if it pops back, it has not sealed properly. If your applesauce starts to develop a fowl odor, become discolored, or if you see signs of mold, these are signs of spoilage and you should discard it! I think some people are weary of canning because it seems complicated or hard, but it’s SO easy, and canned applesauce is the easiest method of them all. Unlike other canning recipes, apples don’t need specific extra ingredients to make them safe for canning. The apples are high in acid and natural sugars, so they preserve well using the water bath method. 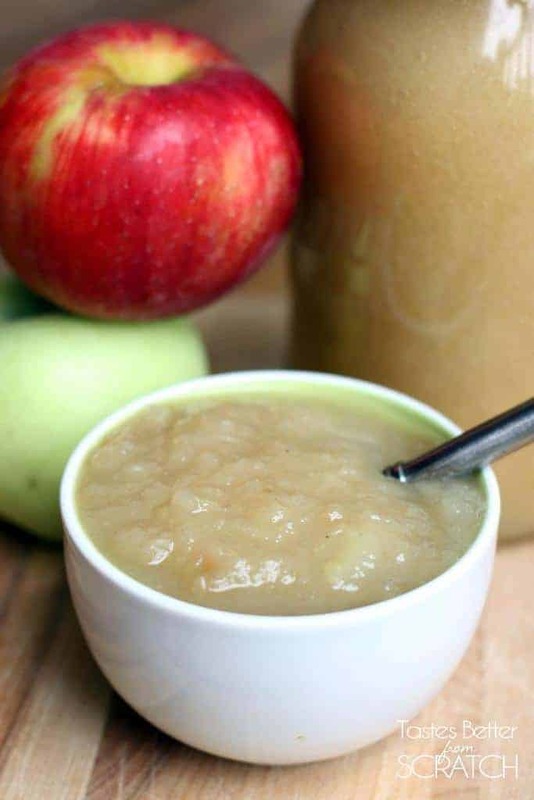 If you have a favorite homemade applesauce recipe, you can use it! I would highly recommend this amazing Instant Pot applesauce or Slow Cooker applesauce recipe for canning. Both are fast and make the process even easier. If you’d like to use a saucepan, I will detail those instructions here. Make sure everything is sterilized! Be sure to sterilize your jars. (I usually run them through the dishwasher before I begin). You will need NEW lids, clean rings, equipment, countertops and workspace. Let’s be safe by making sure we have a clean working environment and equipment! Peel, core, and cut the apples (unless you use a food mill/strainer). Wash the apples well. Then I use a johnny apple peeler to do all three steps at once. Fast and easy! Place apple slices in a large pot and add 1 cup of water. Cook the apples over medium heat, stirring often, until tender. Mash the apples with a potato masher. If you want an even smoother consistency, puree them in a blender. At this point you can add a little extra water if you need to, depending on how thick or thin you want your applesauce. I like to reach the consistency of slightly runny pudding. You can also add sugar at this point, depending on how sweet you want your applesauce. Add a little at a time and taste it until it's how you like. The applesauce will also sweeten over time, in the jars, so keep that in mind when adding sugar. I use white granulated sugar because brown sugar makes the applesauce dark, but either will work. 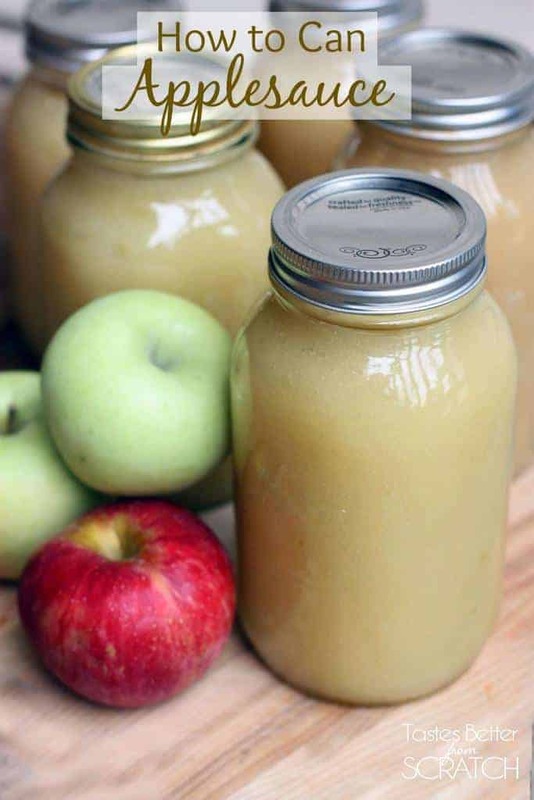 Fill your jars with applesauce leaving 1/2'' of headspace. Use a small rubber spatula to scrape down the inside of the jar and remove any air bubbles. Wipe jar rims clean. Don't skip this step! Place lids and rings securely on the jars. I love Fall for Canning season! Can’t wait to get my hands on some apples and can my own!! I also LOVe to add some Cinnamon to mine! Easier than I would have thought! Looks really good and a great idea to can applesauce. Pinned! I cook my apples in a crock pot so it’s even less work! How long is it good for after canning? Hi Sonia, if canned properly it should last for at least a year, but you could google this to find a more specific date based off of when you make it! Hi! I found your site on Pinterest, and am including a link to this post in a Canning Recipe roundup I am doing today. I hope you can stop by to see it! This applesauce looks yummy!! I’ve been making applesauce but after the water bath it seems to have separated with an inch or so of juice on the bottom. Do you know why that might be? Hi Natalie, Depending on your altitude, this can happen and it’s totally fine! As long as your bottle is sealed, there is no worry. When you’re ready to eat it, just shake or stir the bottle first. 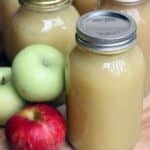 Applesauce is yummy and yes, very easy to bottle. So have a little fun with it! We have added pureed strawberries, bananas, and even used brown sugar and maple syrup to sweeten. Always add fruit that has similar processing times and you are good to go! Enjoy! For a spicy treat Ive added red hot cinnamon candies to the applesauce and its yummy! The tiny candies dissolve leaving a cinnamony hot flavor behind. I love that idea! YUM! Why does the top 2 centimetres go a bit darker than the rest of the applesauce after canning? How can you eliminate this or can you? Hi Linda, that is caused from the air gap “headspace between the lid and the applesauce. You can just scoop it out, and it wont effect the quality.